In order to find authentic beauty, we must move beyond perfection and dig deep to release the creative souls we were born with! 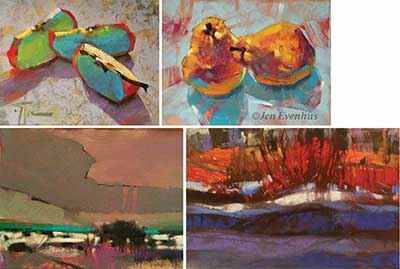 Your pastel paintings will take on new energy, dynamic composition and new color using simplification, confident strokes, exaggeration and movement in this intense 3-day workshop taught by Jen Evenhus, PSA-Master Pastelist, IAPS-Master Circle Member, NPS-Distinguished Pastelist, and PSWC Signature Member. We will manipulate shapes, composition, space, and line. We will move beyond local color into a new realm of uninhibited joy, using whatever color our muse demands, all the while watching for happy little accidents to reveal themselves before we cover them up. We’ll ask ourselves “What if . . .” each step of the way – leaving opportunities open for new ideas to appear. Embrace your wild side as we work hard to be imperfect using an impressionist abstract style to explore shapes, negative space, color-effects and mark-making through discussion, demos, timed exercises, lots of painting, critiques and one-on-one coaching in an encouraging atmosphere. We’ll use markers and unconventional tools like twigs, brushes and charcoal with your pastels to create unique works of art. As a benefit to PPS Members, we will not open registration to the public until May 22.